This weekend is St. Patrick's Day, and while I'm not even a little bit Irish, I can't help but get in the spirit for that one day. I always dress all in green (or at least have some key green pieces), eat Irish soda bread and watch Darby O'Gill and the Little People. If you haven't seen this movie, you should. It'll totally put you in the St. Patrick's Day spirit! Wanna know what my absolute favorite part of St. Patrick's Day is? Making Shamrock Shakes. My mom says you used to be able to get them at McDonald's around this time of the year, but they've kind of phased them out or something, so we just make our own. They are soooo delicious. I've decided to share our recipe with you guys cuz St. Patrick's Day just isn't complete without a tasty, minty milkshake! Directions: 1. Combine all ingredients in a blender and blend on high speed until smooth. 2. Stop blender and stir with a spoon if necessary to help blend ice cream. 3. Pour into cups and serve with a straw! You'll probably need some help from an adult to work the blender (you know how freaky parents get about you using kitchen appliances!) but this is a pretty simple treat to make. And if you invite some of your friends over, they'll be super impressed with your milkshake making skills! So do you guys have any St. Patrick's Day traditions? 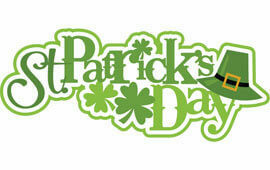 What are you plans for this Irish-themed day? More Blogging from Sindy and Simon! Listen to U2 and eat Irish stew. Play the harp and dance around like a leprechaun. Search for a pot of gold.